Comments: Our own native western azalea. Found in large thickets in the coast range of Oregon and Northern California, its delicious sweet scent can fill the valleys in spring and summer. The clusters of flowers can range from near white to varying shades of pink and sometimes even red. 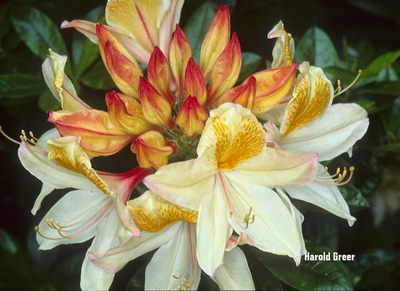 The western azalea was an early contributor in the development of the Exbury azaleas in England.